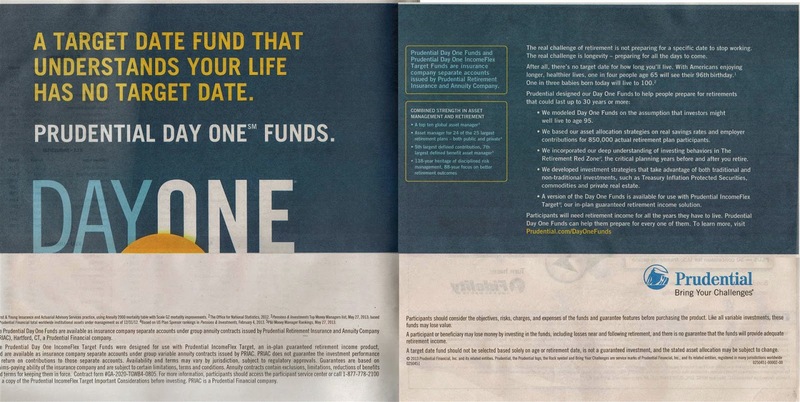 You probably have seen Prudential Day One Funds advertisement from financial magazine or newspaper. This article will review these Prudential target date mutual funds. If you have a 401k account, you might find target date mutual funds as part of the fund selection. These balanced funds are popular among any investors. You can also invest in individual retirement account (IRA), or regular investment account. If you invest in it, the fund will adjust its assets between stocks & bonds. These funds will adjust their assets based on your retirement year target. A Target Date Fund That Understands Your Life Has No Target Date. Prudential Day One Funds and Prudential Day One IncomeFlex Target Funds are insurance company separate accounts issued by Prudential Retirement Insurance and Annuity Company. The real challenge of retirement is not preparing for a specific date to stop working. The real challenge is longevity – preparing for all the days to come. After all, there’s no target date for how long you’ll live. With Americans enjoying longer, healthier lives, one in four people age 65 will see their 96th birthday. One in three babies born today will live to 100. We modeled Day One Funds on the assumption that investors might well live to age 95. We based our asset allocation strategies on real savings rates and employer contributions for 850,000 actual retirement plan participants. We incorporated our deep understanding of investing behaviors in The Retirement Red Zone, the critical planning years before and after you retire. We developed investment strategies that take advantage of both traditional and non-traditional investments, such as Treasury Inflation Protected Securities, commodities and private real estate. A version of the Day One Funds is available for use with Prudential IncomeFlex Target, our in-plan guaranteed retirement income solution. Participants will need retirement income for all the years they have to live. Prudential Day One Funds can help them prepare for every one of them. To learn more, visit Prudential.com/DayOneFunds. According to its website, Prudential claimed that this Day One Funds are designed to help workplace plan participants prepare for retirements that could last up to 30 years or more. The fund is classified in four categories. The first one is 2060-2045 funds, the second is 2040-2025 funds, next is 2020-2010 funds and the last is day one income fund. This Prudential Day One 2015 fund is classified in the Balanced Lifestage category. It has total net assets of $4.65 million. The fund was incepted in June 2009. It has annual expense ratio of 0.77%. As of June 28, 2013, the name of the Target Milestones Funds was rebranded as the Prudential Day One Funds. The portfolio composition of this fund is 54% in fixed income, 29% in domestic equity, 9% in non-traditional and 8% in international equity. This Prudential Day One 2060 fund was formerly known as Target Milestones 2060 Fund. It is in the category of Balanced Lifestage. It was incepted in May 2013. This Prudential fund also has 0.76% annual expense ratio. According to the website, this fund may be suitable for investors who can tolerate a potentially high level of account balance fluctuation. The top portfolio composition is Equity & Non-traditional (97%). The remaining 3% is invested in Fixed Income. The Prudential Day One Income Fund is managed by PRIAC (Prudential Retirement Insurance and Annuity Company). The total net assets are $2.7 million. The annual expense ratio is 0.77%. It was first introduced to public in June 2009. As of the third quarter of 2013, the portfolio composition is 65% in fixed income, 20% in domestic equity, 9% in non-traditional and 6% in international equity. Please avoid any sales load fund. If possible, find index fund.